I'm quite the fan of Dame Judi Dench - then again who isn't on some level? She's quite the amazing actress and she has such a powerful on-screen presence. She definitely changes the tone of any production that she participates in. On another note, I've always enjoyed the movie Misery, which was quite the psychological thriller all in the distinct Stephen King style of storytelling. Kathy Bates was just phenomenal in that movie and ultimately what made it so scary was how intensely real it all felt. Now I had heard about Notes on a Scandal for some time now, but for one reason or another I had never found the time to watch the movie. And having recently caught Skyfall in theaters, it seemed like I was definitely hankering to watch more of Judi Dench in action one way or another. So it was deemed time to finally dig up our copy of this movie and to finally address this particular "To Watch" item. And to have Judi Dench portray an equally chilling Misery-type of role was a lot more intense than I had expected. Synopsis: Notes on a Scandal is a 2006 drama based on the novel of the same name by Zoë Heller. It was directed by Richard Eyre based on a screenplay by Patrick Marber. The movie had been nominated for a number awards including for Academy Awards and three BAFTA Awards, to cite a few. The movie centers around Barbara Covett (Judi Dench) is a rather stern history teacher at a comprehensive school in London. She lives without any family of her own apart from her cat Portia and maintains a unique relationship with her own thoughts through the aid of her diary,which she updates regularly. Throughout the movie we are privy to her innermost thoughts as she updates her journal with all notable events in the story - but of course from her unique point of view. Things start to change once Sheba Hart (Cate Blanchett) joins the school as an art teacher. And everyone seems drawn to the young, beautiful teacher, including the elderly Barbara. She sense a potential kindred in the younger woman and decides that she may in fact "be the one" whatever that means. But she soon discovers that her new "friend" is having an affair with a 15 year old student at the school. And when Barbara confronts Sheba about this, she then decides to use this information to her advantage, essentially arranging fora very subtle form of blackmail to tie the two of them closer together "by the secrets they keep". 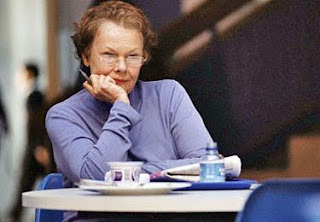 Unlike in Misery, Judi Dench has no need to portray her character as somehow manic or even crazy. She just has a quiet intensity about her, one that on the surface seems decent enough. But that only lasts as long as she shows that twinkle in her eye with just a twinge of malice or she cracks a wry smile that sends a bit of a chill down your spine. And coupled with the haunting musical score and of course her narration as derived from her journal, it makes for one beautiful and yet also disturbing picture. 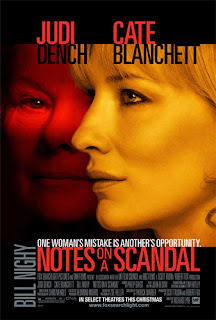 The interplay between Judi Dench and Cate Blanchett is just phenomenal. And while we already know that the two are great actresses in their own right. the interaction between the two makes for some very unique drama indeed as the two manage to complement one another and feed off the energy that each has. And the result is most definitely greater than the mere sum total of their skills and is the main driver behind the success of this movie. It's hard to find things to criticize in this movie. On the whole every actor and actress worked together to paint a complex portrait of what these individuals went through. Their individual pieces came together to braid quite the complex tapestry -a tragic tale of friendship and what happens when it goes too far. Even with a subject as seemingly sensitive as inappropriate relationship between a teacher and her underage student, they manage to present things in a manner that helps you focus on the real source of distress here - Barbara and her rather unique definition of what it means to be a true friend. Words fail me in properly describing why this movie works. Don't expect some Hollywood style thriller romp where you have characters fighting for their lives or running after one another with knives or other improvised weapons. This is not a story that is about something as simple as physical survival. It is all about the battle of wills between the main characters and how they will ultimately manage to find a way to live their lives after the events depicted in this movie. Notes on a Scandal is a wonderfully complex dramatic piece that is carried by the skills of the two women at its core set to a brilliant story of scandal and intrigue. And thus the movie rates a full 5 GOLD STARS out of a possible 5.